EPC “Ingehim” (EPC “Inzhekhim”, as in some older unofficial documents and affiliations in scientific publications of our employees) develops, manufactures and delivers mist eliminators of several types. 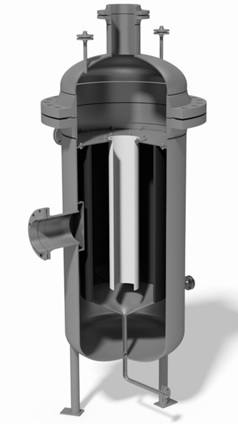 Mist eliminators are designed to remove finely dispersed droplets and splashes of liquid from gases. The principle of operation of mist eliminators is based on preliminary aggregation of micron-sized liquid aerosol particles in coalescing elements and extracting the produced enlarged particles in centrifugal vortical elements. All works on developing and manufacturing of mist eliminators are carried out by our highly skilled engineers with vast hands-on experience in this field. Many of our engineers hold Ph.D. or D.Sc. degrees. Today, mist eliminators developed at EPC “Ingehim” are used at numerous chemical and petrochemical plants, as well as in Russia’s gas industry (see reference-list). To order mist eliminators, please, provide us with all requirement specifications through e-mail.